Portland starter Kevin McAvoy spoke during spring training with SoxProspects.com Managing Editor Matt Huegel about the transition he faced in 2015 in his first full professional campaign. The 22-year-old right-hander is showing signs that those lessons paid off, as he is off to a strong start in 2016. McAvoy moved to 3-0 after allowing a run on four hits in six innings. He struck out five and walked two. Mitch Atkins tossed two perfect innings of relief, striking out three. Chandler Shepherd allowed his first run of the season but also struck out two in his inning of work to earn the save. At the plate, Jake Romanski had three hits, while Wendell Rijo stopped a 4-for-27 skid with a 2-for-4 night. Cole Sturgeon and Derek Miller chipped in with two hits apiece for the Sea Dogs. Yoan Moncada continues to find new ways to lead Salem to victory. With the game knotted, 5-5, in the 12th inning, Moncada came to the plate with one out and the bases loaded. The 20-year-old phenom did one of the few things he had yet to do all season -- he was hit by a pitch, driving home Danny Mars with what proved to be the winning run. It was the second RBI of the game for Moncada, who had already extended his hitting streak to 10 games with a third inning single. He also walked three times, scored twice, and stole his pro-baseball-leading 13th base of the year. He has reached base in all 12 games he has appeared, with a .357/.509 /.524 slash line. Andrew Benintendi continues to nearly match Moncada's early-season brilliance. He tripled for the sixth time this year, driving in three runs as part of a 2-for-5 night. The 2015 first-rounder has 10 extra-base hits in 13 games. Mauricio Dubon raised his average to .362 with a 3-for-7 performance, while Bryan Hudson and Nick Longhi had two hits apiece. It was a strong outing on the hill for Travis Lakins. In five innings he allowed five hits, striking out seven and walking two, with the lone run coming on a fourth-inning solo home run. The Mudcats scored three runs in Mario Alcantara's two innings of work. German Taveras surrendered the tying run in the bottom of the ninth, but that was the only blemish against him in four innings of work. Yankory Pimentel struck out one in a perfect 12th to record his second save. Somewhat in the shadow of the Salem Red Sox, whose star-studded roster and fantastic start to 2016 has been the topic of daily conversation, Greenville has matched them with a 9-4 record. Every batter in the lineup had a hit on Tuesday, totaling a 19-hit attack that led the Drive to their fifth straight victory. Luis Alexander Basabe led the charge, going 4 for 6 with one of five Greenville home runs, two RBI, and two runs scored. Michael Chavis homered for the third consecutive game, going 2 for 4 with two walks. Boston's top pick in the 2014 draft, Chavis looks to have bounced back from a tough 2015 season, hitting .388/.444/.633 in the early going. Kyri Washington clubbed his team-leading fourth home run, while Austin Rei and Joseph Monge both connected for their first blast of the season. Rei also tripled as part of his second straight two-hit game. The offensive explosion made for a relaxed night on the mound for Logan Boyd. The southpaw allowed two runs on eight hits in six innings, striking out three without issuing a walk. Jeffry Fernandez picked up the first save of his professional career, as well as what is almost certain to be the easiest. Fernandez entered the game with a 12-2 lead and pitched three innings of relief, giving up two runs (one earned). 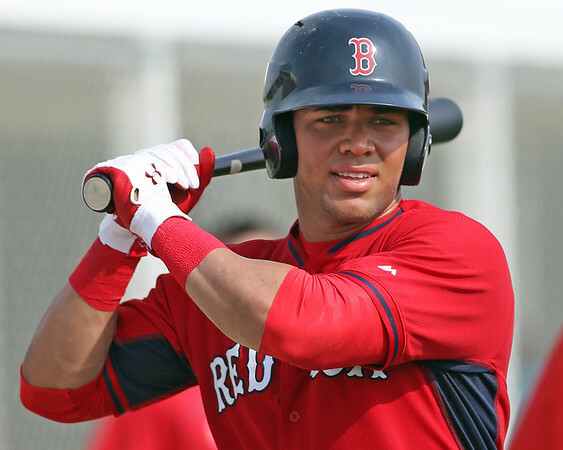 Player of the Day: There has been little Yoan Moncada hasn't done in the early season. Surprisingly, until now, he had not yet won recognition as SoxProspects.com Player of the Day. On a day with a strong field of contenders, particularly a monster game from Luis Alexander Basabe, Moncada gets the nod for reaching base five times and for the unusual way he "drove" in the winning run. Getting hit by a pitch in the 12th inning with the bases loaded was not a glamorous way for Moncada to be the hero, but it typifies a player who has made an out in less than half of his plate appearances.